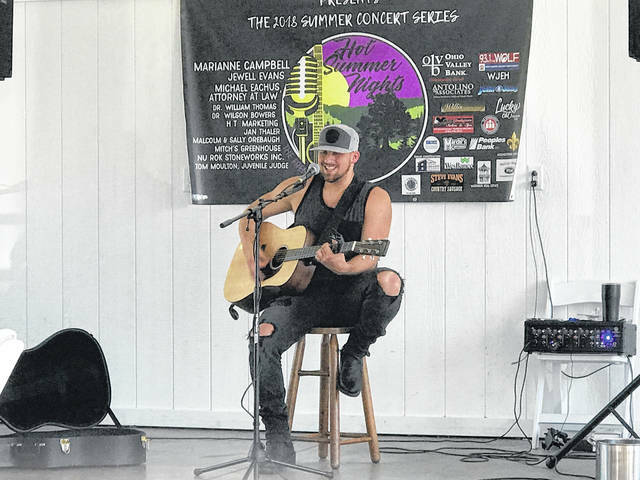 Local artist Devin Henry of Gallipolis plays the Hot Summer Nights stage at the French Art Colony on Thursday evening. Henry, who just returned from CMA Fest in Nashville, Tenn., is pursuing a career in country music while building a loyal following playing local venues. Next week, the Hot Summer Nights concert series welcomes to the FAC pavilion New Jasper Station, with members Jenny Walker, Mark Ward, Joel Ramsey and James Gettles. https://www.mydailytribune.com/wp-content/uploads/sites/42/2018/06/web1_6.15-Dev.jpegLocal artist Devin Henry of Gallipolis plays the Hot Summer Nights stage at the French Art Colony on Thursday evening. Henry, who just returned from CMA Fest in Nashville, Tenn., is pursuing a career in country music while building a loyal following playing local venues. Next week, the Hot Summer Nights concert series welcomes to the FAC pavilion New Jasper Station, with members Jenny Walker, Mark Ward, Joel Ramsey and James Gettles.